So often we carry things around because we don’t have a solution, because we can’t let go, or because we think we deserve to be weighed down. Instead of breaking free, we keep going. We keep carrying the extra weight. And we don’t just carry our weight, but we try to carry the weight of our loved ones, and the weight of the world. If the guilt, fear, regret, anger, worry, stress, frustration, pain or whatever it is you are carrying is too heavy, put it down for a while. Put it down and take care of your heart. Put it down and rest. Put it down and write about your struggles. Put it down and ask for help. It’s almost impossible to have clarity on next steps or to really know what you want when you are carrying too much. Perhaps, after you put it down and feel light, you can move towards giving it away, forgiving yourself, and letting go. You don’t deserve to be weighed down. You deserve to feel light. You deserve a minute of peace. You deserve to smile, laugh, and to be free. 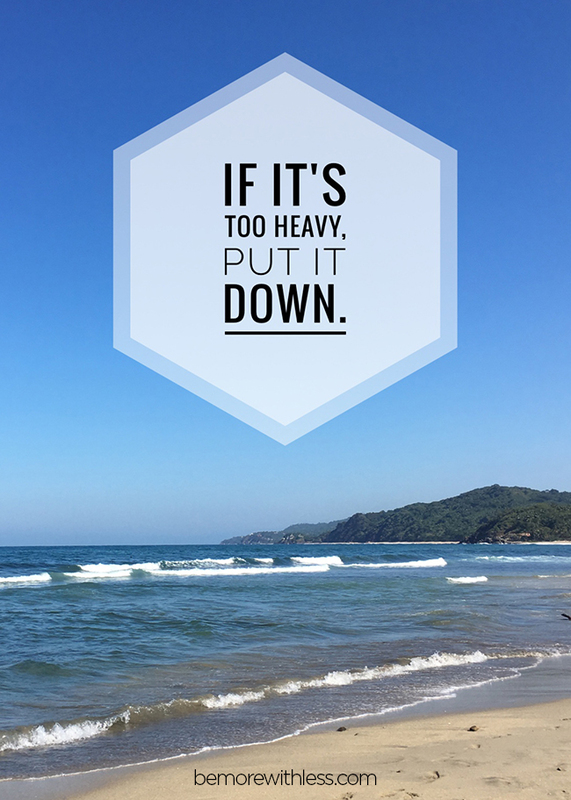 If it’s too heavy, put it down. So beautiful, so simple – thank you! Oh. my. gosh. You wrote these words just for me. I’ve been carrying around a huge load, and it’s getting way too heavy. Once again very inspirational! Just what I needed today. Thank you! Thanks. Whatever you are carrying, you picked up. I agree Courtney. Sometime when I am navigating life and taking care of EVERYTHING I forget to slow down and take care of myself. Thanks for the reminder. „these mountains that you are carrying, you were only supposed to climb.“ by najwa zebian. Right. Take the weight off. Leave your past behind. Leave your fears. Feel the moment and focus on the present and give your current action your all. Thank you for such an inspiring post Courtney. This is perfectly put Courtney. Such a simple concept, yet not always easy to do. This moved me so much I burst into tears. I have been struggling with an endless cycle of guilt, buying and recluttering and this gave me the permission I needed to let the guilt go and donate it. Thank you so much for this post. Thanks, Courtney, inspiring as always. We do have to care of ourselves and people around instead of our stuff.